400-BH-DST is rated 3.3 out of 5 by 7. Rated 5 out of 5 by Tim from Classic Delta It works smoothly, shuts off when you want it to, and is a beautiful graceful shape. We love it. Rated 1 out of 5 by hermit1 from works flawlessly! Installed this about 18 months ago. Easy installation, durable chrome finish, still looks new! Rated 4 out of 5 by Deltacustomer from Good quality and nice appearance. 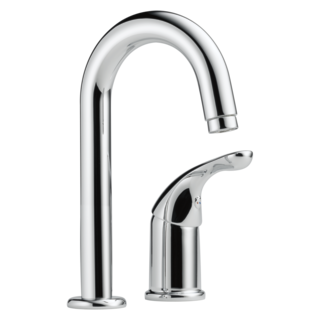 This is a good quality faucet with a very nice appearance, particular for a basic type of faucet. (I have the model 400-DST, with a chrome finish.) It works very smoothly; no problems. It was a replacement for another Delta faucet which we had for a number of years. It was professionally installed, so I cannot comment on ease of installation. The lifetime guarantee is a plus. 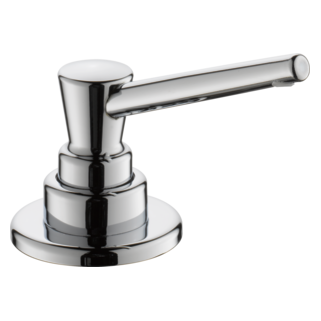 Rated 2 out of 5 by Pete55 from Not happy with Delta I have Delta faucets in all my bathrooms and kitchen and have always been very happy with the quality . However, I replaced the kitchen faucet approx. 2 years ago and the new stuff is lousy.My Delta kitchen faucet lasted 25 years, was well made and only had to be repaired 2 times. The parts were cheap and the job was easy.Now, the new one..very flimsy with plastic feed lines. I thought it made the job easier to do and I was right. It was easy to install. 6 months later I couldn't get it to shut off completely. Called Delta and they sent me a cartridge to replace. It worked ! Recently, my wife noticed water under the sink, and after some investigation I found that the sprayer was leaking where the sprayer connects to the under part of the faucet. Called Delta and they sent me a sprayer. I replaced it and 2 weeks later its leaking again. I went to the local plumbing supply and bought another sprayer to see if theres any difference..now that one is leaking also. They are easy to replace but they leak at the connection . Very disappointed in this construction. I would advise against buying this model or any model with this type of connection on the sprayer.Sorry Delta, no longer a big fan. Rated 1 out of 5 by AlTheEngineer from Works Well But Feels Flimsy I bought this one to replace a different brand faucet that was getting hard to operate. Installation was very straightforward and the faucet functions very smoothly. I was, however, quite unhappy with the quality of construction. The base appears to be plastic, not metal and it doesn't hold the faucet very steady. Like another reviewer said, just moving the handle to turn the water on and off causes the whole faucet to flex and rock back and forth, and yes, the faucet is tightened down well on a very flat sink surface. My wife said it seemed like a "doll house faucet". I'd return it if I could, but I already installed it. I am a mechanical engineer and I actually worked in plumbing design back in the 1980s so I have at least a little idea about what I'm talking about. 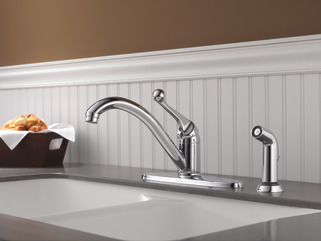 I've installed several Delta faucets in the past and was always satisfied. They were very solid and easy to work on when they did need service. This one doesn't inspire confidence. Maybe it will stand up to long term use. I'm hoping for the best. 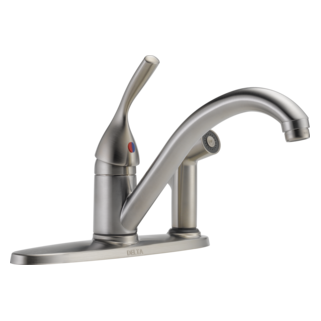 Rated 5 out of 5 by plum7 from Classic Single Handle Kitchen Faucet with Spray very nice faucet no drips and a easy install so far one of the best faucets I have installed. Thank you for your question. 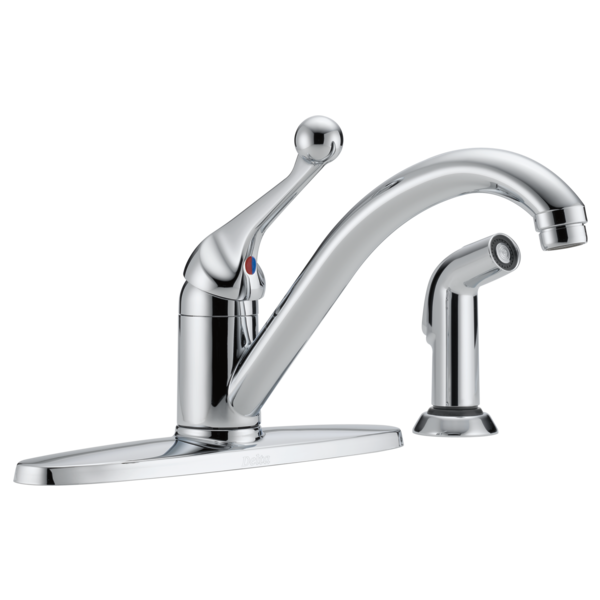 Currently, a black sprayer is not available for shipment with the Delta Faucet model #400-BH-DST. We would recommend ordering Delta part # RP26878 (black side spray), remove the spray head and transfer to the hose that ships with the 400. How do I disconnect the sprayer hose to put on a new one? I need to replace the side sprayer. The connection has a separated blue band. Do I left up on it with a screwdriver to release the sprayer hose?